Delivering high-quality services with greater speed and efficiency is one of the greatest pressures facing your information technology (IT) infrastructure. The rise of cloud computing, expansive mobility options, fast-growing pools of data, and expanding security threats add even more complexity to your day. Traditional, siloed IT systems are often too laborious and slow to overcome these challenges. Building on 25 years of server market leadership, the Hewlett Packard Enterprise ProLiant Gen9 portfolio powered by Intel®Xeon® processors—which includes Hewlett Packard Enterprise OneView software for simplified, converged management—offers optimal performance, increased storage, reduced energy consumption, and greater visibility and control across IT environments. Now everyone from enterprises to small and medium businesses (SMBs) can lower the cost of IT services, reduce delivery times, and improve their overall performance to gain a competitive edge. 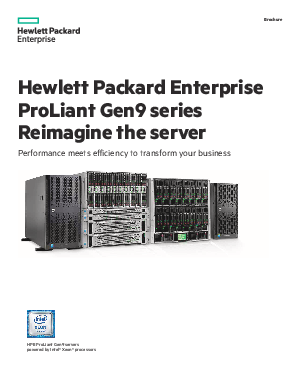 Download this white paper to learn more about the Hewlett Packard Enterprise ProLiant Gen9 portfolio powered by Intel®Xeon® processors.